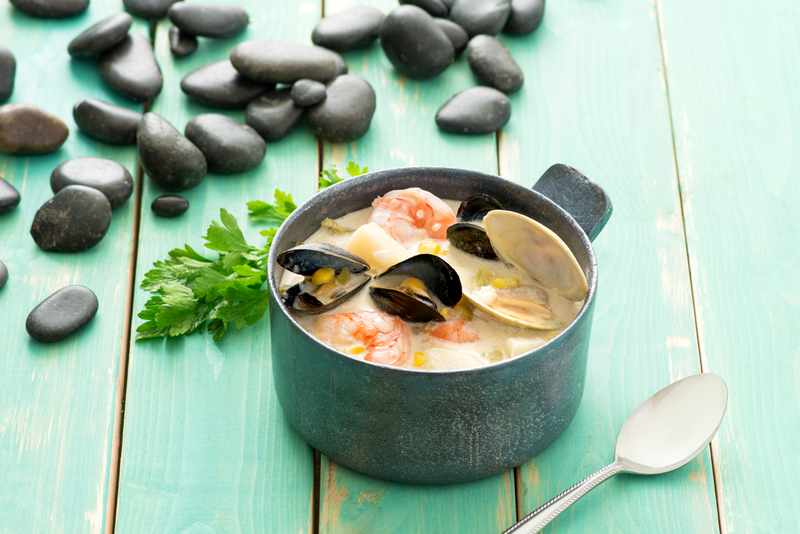 Enjoy this creamy seafood chowder recipe made with mussels, shrimps, and clams. In Dutch oven or large saucepan,melt butter over medium heat; cook onions and celery,stirring often,for 5 minutes or until softened but not browned. Stir in potato,salt,pepper,bay leaves and cayenne pepper. Pour in broth; bring to boil. Reduce heat and simmer for 10 to 12 minutes or until potato is tender. Add cream; reduce heat to medium-low. Add clams and corn; cover and cook for 3 or 4 minutes. Add shrimp and mussels; cook for 5 to 7 minutes or until clams and mussels have opened,discarding any that have not opened. Discard bay leaves. Sprinkle with parsley before serving. Mussels and clams can be stored in the coldest part of the fridge,covered with a damp towel,but never in an airtight container or submerged in water,for up to 3 days. To clean mussels: Discard any mussels that have broken shells or that do not close when lightly pressed together. Remove the threadlike beard by pulling toward the hinge of the shell until it is released; discard. Wash the mussels under cold running water using a vegetable brush to scrub shells clean. To clean clams: Discard any clams that have broken shells or that do not close when lightly pressed together. Place clams in a bowl of cool,fresh water and cover with a damp kitchen towel. Refrigerate for 20 minutes to 1 hour; repeat up to 3 times to remove as much sand as possible. Use a vegetable brush to scrub shells clean. 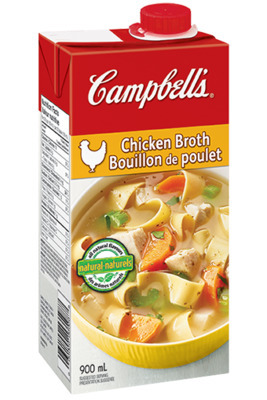 Reduce sodium by using Campbell’s® Ready to Use 30% Less Sodium or No Salt Added Chicken Broth. Choose 10% cream instead of 35% cream for a less indulgent option.